, knight, lord chief justice of the court of King’s-bench in the reign of king William, was son of sir Thomas Holt, knight, serjeant at law; and born at Thame in Oxfordshire, 1642. He was educated at Abingdon-school, while his father was recorder of that town; and afterwards became a gentleman -commoner of Orielcollege, Oxford. In 1658 he entered himself of Gray’sinn, before he took a degree; some time after which he was called to the bar, where he attended constantly, and soon became a very eminent barrister. In the reign of James II. he was made recorder of London, which office he discharged with much applause for about a year and a half; but refusing to give his hand towards abolishing the test, and to expound the law according to the king’s design, he was removed from his place. 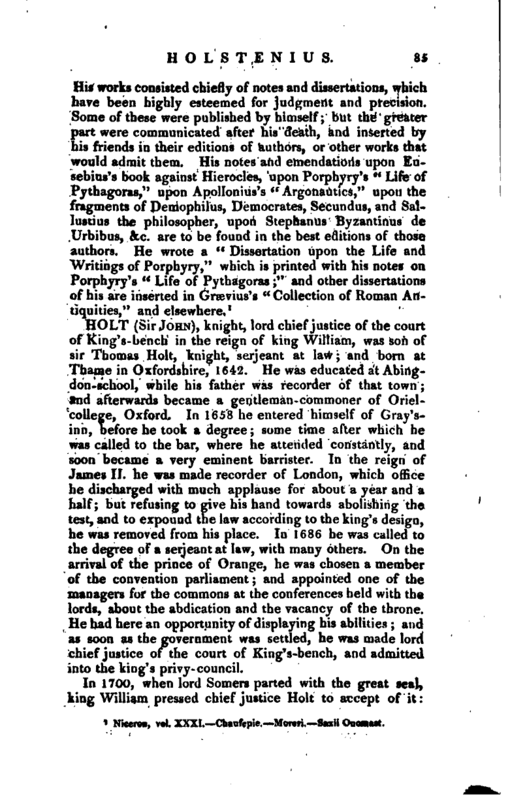 In 1686 he was called to the degree of a serjeant at law, with many others. On the arrival of the prince of Orange, he was chosen a member of the convention parliament; and appointed one of the managers for the commons at the conferences held with the lords, about the abdication and the vacancy of the throne. He had here an opportunity of displaying his abilities; and as soon as the government was settled, he was made lord chief justice of the court of King’s-bench, and admitted into the king’s privy-council. In 1700, when lord Somers parted with the great seal, king William pressed chief justice Holt to accept of it: | but he replied, that he never had but one chancery cause in his life, which he lost; and consequently could not think himself fitly qualified for so great a trust. He continued in his post twenty-two years, and maintained it with great reputation for steadiness, integrity, and complete knowledge in his profession. He applied himself with great assiduity to the functions of his important office. He was perfect master of the common law; and, as his judgment was most solid, his capacity vast, and understanding most clear, so he had a firmness of mind, and such a degree of resolution, as never could be brought to swerve in the least from what he thought to be law and justice. Upon great occasions he shewed an intrepid zeal in asserting the authority of the law; for he ventured to incur the indignation of both houses of parliament, by turns, when he thought the law was with him. Several cases of the utmost importance, and highly affecting the lives, rights, liberties, and property of the people, came in judgment before him. * There was a remarkable clearness and perspicuity of ideas in his definitions; a distinct arrangement of them in the analysis of his arguments; and the real and natural difference of things was made most perceptible and obvious, when he distinguished between matters which bore a false resemblance to each other. Having thus rightly formed his premises, he scarcely ever erred in his conclusions; his arguments were instructive and convincing, and his integrity would not suffer him to deviate from judgment and truth, in compliance to his prince, or, as observed before, to either house of parliament. They are most of them faithfully and judiciously reported by that eminent lawyer, chief justice Raymond. 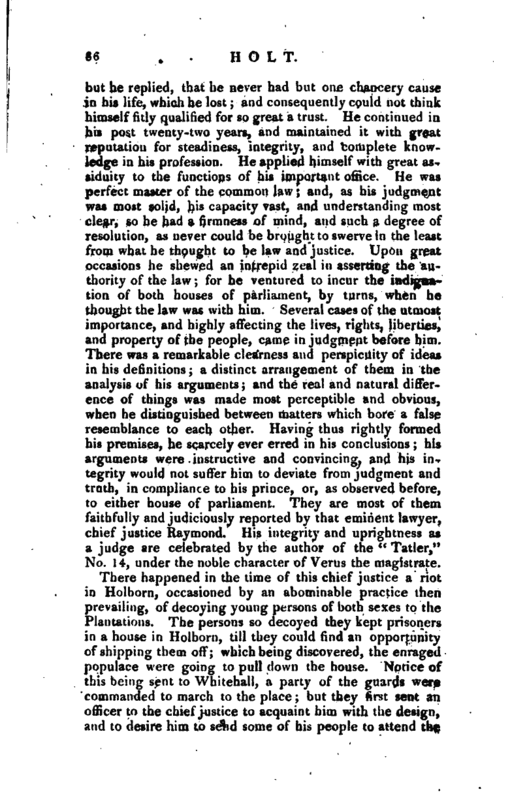 His integrity and uprightness as a judge are celebrated by the author of the “Tatler,” No. 14, under the noble character of Verus the magistrate. There happened in the time of this chief justice a riot in Hoi born, occasioned by an abominable practice then prevailing, of decoying young persons of both sexes to the Plantations. The persons so decoyed they kept prisoners in a house in Holborn, till they could find an opportunity of shipping them off; which being discovered, the enraged populace were going to pull down the house. 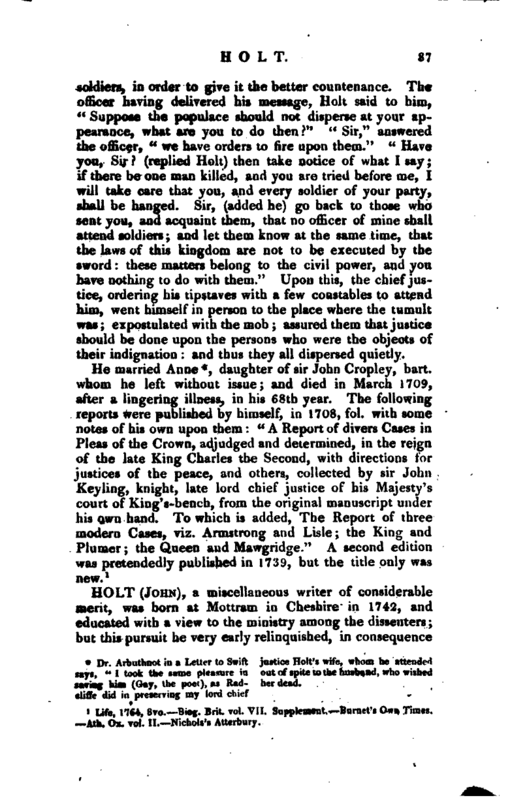 Notice of this being sent to Whitehall, a party of the guards were commanded to march to the place; but they first sent an officer to the chief justice to acquaint him with the design, and to desire him to send some of his people to attend the | soldiers, in order to give it the better countenance. The officer having delivered his message, Holt said to him, “Suppose the populace should not disperse at your appearance, what are you to do then?” “Sir,” answered the officer, “we have orders to fire upon them.” “Have you, Sir? (replied Holt) then take notice of what I say; if there be one man killed, and you are tried before me, I will take care that you, and every soldier of your party, shall be hanged. Sir, (added he) go back to those who sent you, and acquaint them, that no officer of mine shall attend soldiers; and let them know at the same time, that the laws of this kingdom are not to be executed by the sword: these matters belong to the civil power, and you have nothing to do with them.” Upon this, the chief justice, ordering his tipstaves with a few constables to attend him, went himself in person to the place where the tumult was; expostulated with the mob; assured them that justice should be done upon the persons who were the objects of their indignation: and thus they all dispersed quietly. Dr. Arbuthnot in a Letter to Swift says, "I took the same pleasure in saving him (Gay, the poet), as Radcliffe did in preserving my lord chief justice Holt’s wife, whom he attended out of spite to the husband, who wished her dead. Life, 1764, 8vo. Biog. Brit. vol. VII. Supplement, Burnet’s Own Times. —Ath. Ox. vol. II. Nichols’s Atterbury.